SYDNEY - Lamborghini Club NSW Sydney Drive to Centennial Vineyards at Bowral - I woke up super early in the morning to get ready as I was feeling extremely excited about going for this Lamborghini Club NSW Sydney drive as the President - Mr John Edwards told me that there was going to be a huge turnout with more than 30 cars and I was not disappointed. 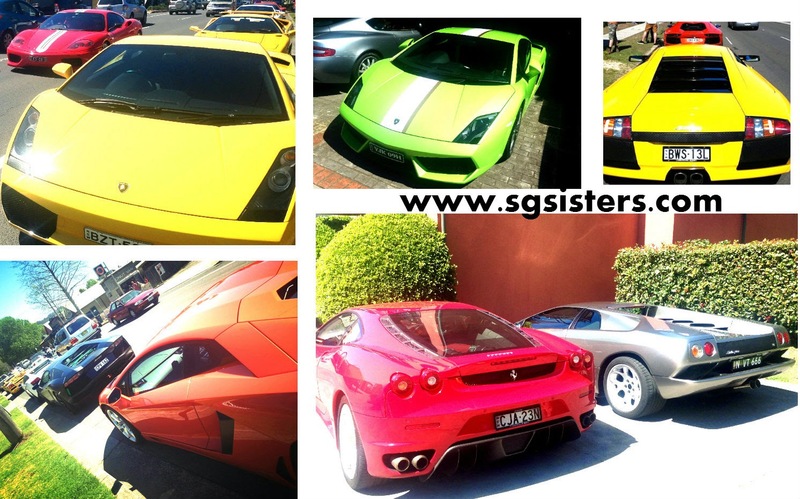 It was great that other car models were allowed to join us Lamborghini car owners as well. Clearly, the Lamborghini Club is not snobbish in any way and is extremely friendly, welcoming and inviting towards other car enthusiasts. 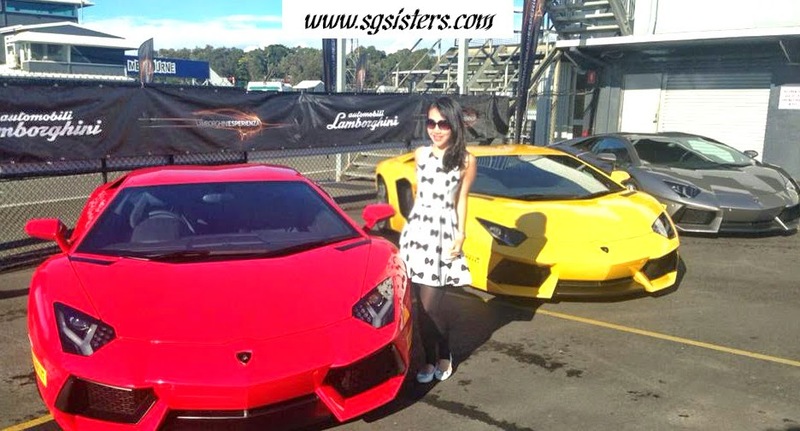 I was dressed in my new bright yellow shorts to match the colour of my yellow Lamborghini Gallardo Spider together with my lovely Louis Vuitton Epi leather Alma handbag :) Thank you sister Sara Shantelle Lim for giving me a gorgeous LV scarf to tie on the bag too! LIVE VIDEOS - I reminded myself that this time, no matter what, I must remember to take live videos to capture the amazing moments of driving in a colourful convoy of Lamborghinis, Ferraris, Aston Martins, Audi R8, Panteras etc. Check out 8 awesome Youtube videos I took during this drive :) I must admit it was extremely difficult for me to take good videos as I had to stretch out my hands really high and zoom in on the fast moving cars around me. I don't have very long arms you know! Furthermore, the wind was blowing very strongly and my slim and thin iPhone was almost blown off my hands as we were traveling at high speeds on the Highway roads. 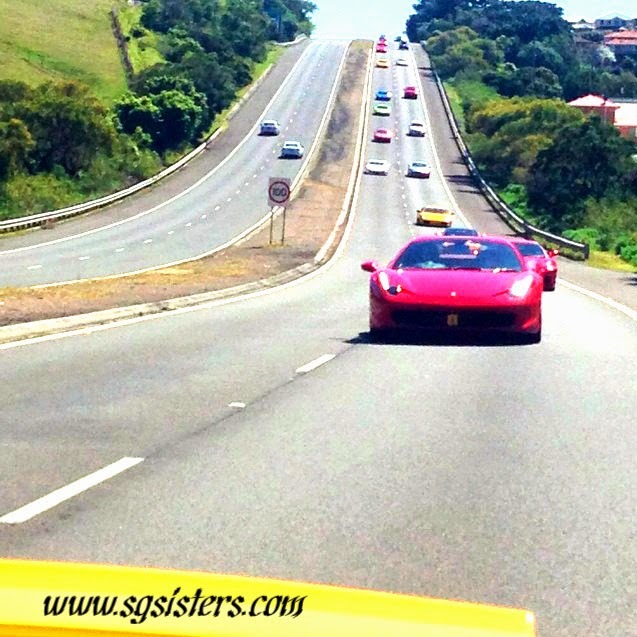 It was a beautiful sunny day for us car enthusiasts and we enjoyed the drive tremendously. Special thanks to Mr John Edwards for organizing this! AUBURN - Upon arriving at the first meeting point at D'elegance Showroom at Auburn, there was already quite a number of cars. It was great to meet new people again and I must say that so far, all the car enthusiasts I have met are extremely nice, sincere and down to earth people. I enjoy talking to the different people and take photos of their precious cars. If you noticed the car plates in my photos, they do reveal individual characteristics of their very own car owners. Such as the car plate 'H3art" actually belongs to a Cardiologist! Very interesting indeed! I am still wondering if the car plate "A" actually refers to the Apple fruit or the Alpha male? *winks- You guys wouldn't want to know what my signature car plate means as it is totally hilarious! 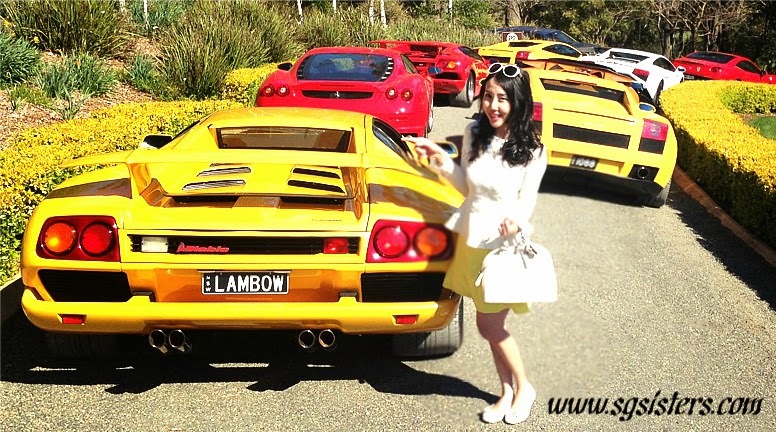 HEATHCOTE STATION - When we arrived at the second checkpoint in Heathcote, it was a splendid sight to see a beautiful lineup of more Lamborghinis and other cars! We quickly drove off as the surrounding traffic around us were slowing down to take photos of our cars and causing a huge traffic jam. We drove towards Berry for light morning breakfast. I seriously needed a coffee! BERRY - At this third meeting point, we stopped for morning breakfast and coffee at a small cafe. It was great to watch many children from this local town getting excited about taking photos with our cars and it was always nice to see that our beautiful cars were able to put smiles on other people's faces especially the little kids. 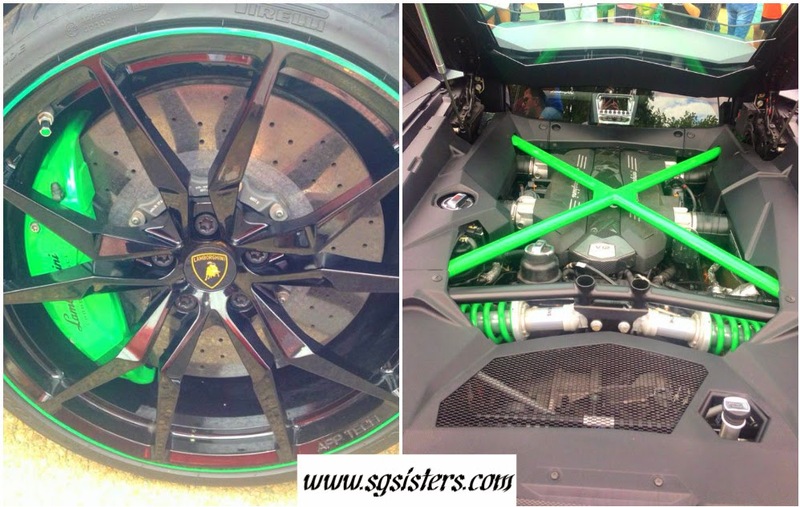 Most of the children were fascinated by the Black and Green Lamborghini Aventador as it reminded them of Batman or Green Lantern. 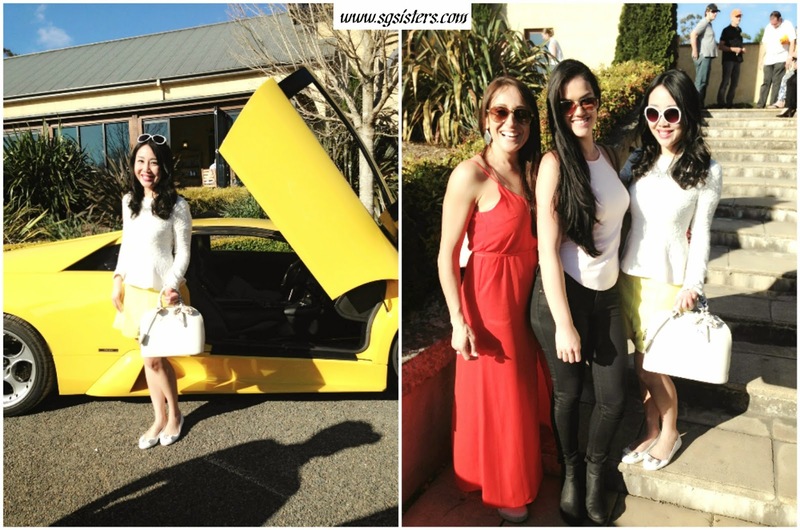 CENTENNIAL VINEYARDS, Bowral - Our final destination was a relaxing and delicious lunch at Centennial Vineyards in Bowral. It was a 3 course meal and it was great catching up with fellow friends. 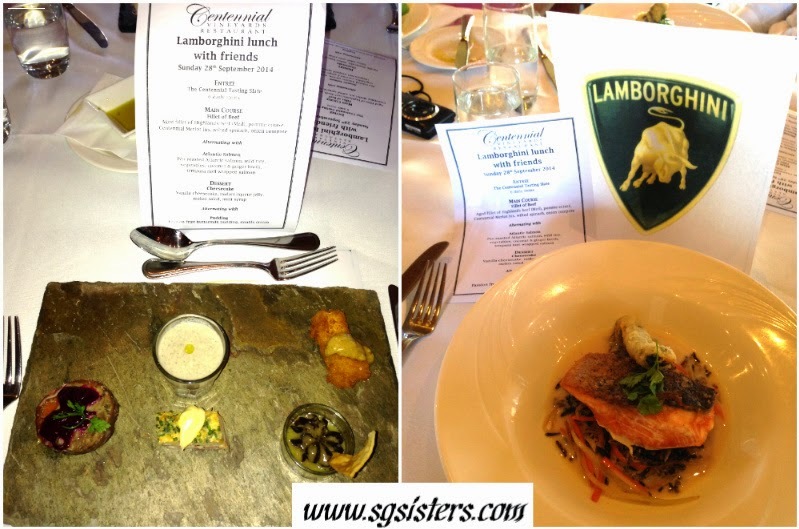 Do take a look at the customized Lambo Menu! We also took a group photo at the end together on the steps before heading home. I must also hereby confess that I sneakily exchanged my pudding with someone else's cheesecake :X Hopefully he wasn't too mad! VIDEOS - Here are 4 out of 8 videos I took. You can find the rest on my YouTube. Just Google or Youtube search "Lora Christelle Lim"
and Ferrari 458 chasing me :X - Who on earth honked at me?? ?